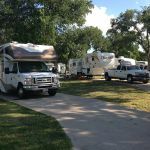 Ask fellow campers about "Oak Forest RV Park" and nearby attractions. Stayed for one week for $99 promotional price. 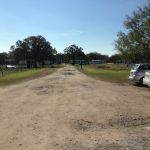 One of the best RV parks we have stayed in with an incredible array of tiny homes and very well developed sites. Staff were friendly and hospitable. Excellent access to Austin area! We camped at Oak Forest RV Park in a Travel Trailer. Stayed three nights. We stayed in the newer section of the park and there was plenty of room for our 41' MH and 4dr Jeep. The park is clean and well kept. We camped at Oak Forest RV Park in a Motorhome. Downtown Austin is a must visit. The Oasis at Lake Travis is a great place for lunch or dinner. Construction taking place with lots of noise several mornings. Should be temporary though. Fantastic common facilities. Extensive handicap accessibility to the pool and deck areas. Beautifully done with great provisions for anyone handicapped or unsteady to access the two swimming pools. Nice fitness room and laundry facilities. Cable TV at each site. Service pedestal was on the wrong side of our site and was in need of repair. The fresh water spigot was unusually close to the sewer connection. The staff is very friendly and courteous. Curiously there is no propane refilling available and they won't allow a mobile service in to help you. The park is partially much older than the main area. It is also has a growing number of permanent Tiny Homes you can purchase and lease the site if you don't wish to RV. Another area has Tiny houses for daily rental. We camped at Oak Forest RV Park in a Motorhome. Very nice park on the east side of Austin, out of the hustle and bustle but still close to downtown shopping and restaurants. Easy to find and easy to get around in. Park is full of full time workers but most are in other sections of the park. Park is expanding with several new areas that are very nice. Check in was quick, office folks are very nice and efficient. Our site was # 12, very good site, plenty of space between neighbors, 50 amp was steady, water pressure was 60 PSI although there was an outage due to nearby construction which lasted all day. There was no notice given. I called the office and inquired about it and was told it happens a lot and would be off all day, so that's not good. Internet was so so, used our verizon hot spot which worked fine. Very nice pool area, nice dog park. Lots of room to walk. Stayed for a week and really enjoyed our stay. We will be back. We camped at Oak Forest RV Park in a Motorhome. There is a grocery store just down the street that had everything we needed plus a large convenience store and gas station. There is also a very nice meat market across the street from the grocery store. Stayed here while visiting friends, relatives, and Doctor appointments. When we started staying here five years ago it was quite a bit smaller. It has expanded under the Roberts Resorts banner. Many new sites closer to Decker Lane that can and do accommodate families with children and Roberts have brought in tiny homes for rental purposes. We stayed in the pull throughs across from the pools and site was level concrete with good pedestal placement with electric, sewer drop, hose bib and cable tv hookup. Site long enough to unhook and still have plenty of room for the tractor. This was site #8. To sum up we enjoyed the visits and being close to friends and Doctors on our way north for the summer. We camped at Oak Forest RV Park in a Fifth Wheel. The newer sites are of different lengths and are laid out with different approaches as far as backing in to the sites. All the newer sites are backins so be sure you are comfortable with the site you are assigned. No shade in the new section. Nice park, comfortable site with picnic table and level concrete pull through. Full hook ups long enough for big rigs. The park was convenient to Austin although there is no public transportation from here. Quiet area with lake Long a few miles away for fishing and boating. Many other lakes, hiking paths, biking and swimming in the area. Our disappointment with the park was that the pools are not heated. Our grandsons were visiting and spent many hours in the hot tub (which we were later told they were not supposed to use) and the smaller pool nearby that was somewhat warm. The pool and pool was area in need of cleaning! The on-site laundry facilities are cost effective but the driers need temperature adjustment/repair. If you are looking for any tourist information or personal services you need to go to the downtown tourist information- visitors location in downtown. They are dynamic with their information. The office staff here knows nothing except where local grocery stores are located. Cable connection was good internet adequate. The tiny homes on this property are fun to see and plan for the future. We camped at Oak Forest RV Park in a Travel Trailer. So much to see and do in Austin. Do check in with the downtown visitors center. This was our second time staying here & things seemed a little worse. The park is still nice scenery wise but they have expanded quite a bit and used all the treed open space picturesque area which gave this park its beauty. Trash pickup was spotty with bags of trash left for days at sites. Laundry room was locked closed with sign on door saying dryers didn't work. Also 2 of the 4 restrooms were out of order. Fitness room seemed a little worse for wear with no way to clean & disinfect equipment after use. There are also no security measures at this park. I will say however that my husband asked the office if they could trim some branches so they wouldn't scrape the top of the coach upon exiting & they did so. Might return if I hear they got their act together. We camped at Oak Forest RV Park in a Motorhome. If you are planning to stay here because you have been to other Roberts' resorts, you will be disappointed. There is no clubhouse, no activities and the remaining amenities are below anyone's expectations: One laundry room closed, the other filthy dirty. When I brought this to management's attention, I was told that they are aware of "outsiders" using the laundry room. I would think that they could address that issue somehow. The work-out room is about a 12 x 12 room with 3 pieces of equipment. I was told that Roberts took over this resort three years ago and are planning major additions and renovations. At the pace they are going, I would suggest to give them another 10 years before visiting. Also, management there was more interested in their efforts to open another part of the "resort" rather than addressing the concerns of the guests. In addition, most other "campers" have a full-time job in Austin while living in their RV, so you have no one around all day. So you're on your own.......no camaraderie. We camped at Oak Forest RV Park in a Motorhome. Big rig friendly with level sites. Easy exit from I35. Laundry and WiFi was good. Dog park was small but nice with bags provided. Showers were old but worked fine. Campground was level and good to walk or ride bicycle. We camped at Oak Forest RV Park in a Travel Trailer. Walmart and restaurants were 8 miles. Capital and downtown Austin was 10 miles. Lots of construction making the driving difficult. A good commercial park on the east side of town. A little far from everything of interest and a ton of road construction in the area, but a good choice for Austin. Easy check-in, level, long enough site, albeit a little narrow. Good separation from the neighbor. Utilities good and easy to reach. However, they didn't mention that you can only get cable TV with a box, which I saw on the info sheet after plugging in the cable feed and trying to figure out why the tv couldn't find any stations. Used satellite which was unobstructed. Pool appeared nice with a large exercise room nearby. Park appeared to still be building more sites. We would return. We camped at Oak Forest RV Park in a Motorhome. We've stayed here quite a few times, There are discounts, however we checked in late on a holiday weekend without staff in the office. There are not a lot of choices in the Austin area, and this one is getting a huge addition. We come here because of the location to downtown. We are quite familiar with Austin and don't need GPS to get around like someone from out of town/state/country might. Which why assume some people talk about "construction" or "busy" roads. All roads in Austin a busy, especially at the more used RV parks. Take my word for it when I say you will not find a better kept park in the area, state or privately owned park. Another pool is being added as well as another section to the park, it looks quite large and will probably change its name to Oak Forest RV Resort soon. I remember the previous owners and cheaper prices, but those days are gone, just like most other larger parks. However we needed a place to stay, we called, left a message not expecting to get a call back, but they called us back, on July 3rd to tell us they were booked. About an hour later they called back saying one site opened up for one night. They could have easily written us off due to it being the 4th weekend, but didn't. This was all happened after 5:00 pm. There was no price hike like some other parks due to the holiday weekend. Our site was pull through with some shade across from the pool. The park has some full-timers and winter Texans, but most of those are located towards the back of the park. Heat index was 106, the pool was plenty cool enough and will some shade it was okay to be outside. We will be back. We camped at Oak Forest RV Park in a Motorhome. MLK to downtown Austin. This park is getting ready to explode in size. We spent a week here while visiting family. There was a lot of noisy construction going on while we were here as they're adding a LOT of additional sites to the park. Navigating through the park is tight in places but doable. We had a front row spot. We camped at Oak Forest RV Park in a Fifth Wheel. It's Austin! Too many places to see and too much to do. We were visiting family and had occasion to go downtown a couple of times. Austin is a unique city but the traffic is horrid and you literally "can't get there from here" in so many instances. Takes forever to get somewhere due to having to go past, u-turn and and go back. Crazy street designs. 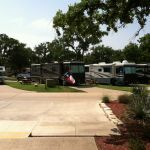 Although Oak Forest was my "go to" RV park in Austin for years, I don't stay there as often as in the past. Rates have increased beyond value, and management is cold (however, the staff is always helpful). They are in the process of expanding all the way out to Decker at a cost that must be enormous. So, I guess they need the additional income. Still easy ingress/egress, with nice, long, paved sites that have a reasonable amount of space between them. We camped at Oak Forest RV Park in a Motorhome. This should be a great place, based on its construction but, grounds keeping is poor, rules are many, staff is uninformed, lazy, remote and less than friendly. The short term site are long, beautiful, paved pull thru. Hook ups work well. There is a very large section of long term residents, separate from the short term sites. A huge addition to the short term section is being constructed. There is a nice pool, but no playground. We saw no children. There were a number of high end rigs. This place could be amazing. But it needs to grow up. We camped at Oak Forest RV Park in a Fifth Wheel. We had a good stay at the park. Quiet at night. The park is currently expanding so during the day the construction machinery noise was noticeable. The concrete pad was narrow as others have noted. The park advertises free cable, but receiving cable stations requires using a cable box, which is free for the daily rate, but I was told that they didn't have any more cable boxes available and there were probably 6 empty daily rate sites available. We were able to receive several over-the-air TV channels. We camped here in our Motorhome. We will consider returning to this park. We camped at Oak Forest RV Park in a Motorhome. Austin is about 8 miles away. Try the River Walk around the lake. Downtown. Austin traffic is bad, avoid rush hour. Walmart was about 10 minute. Plan on long delays on I35N which is going thru major construction. Austin is awesome! Moonshine grill is fantastic. Great town to wander around. The River Place hike was fantastic. Austin has food, shopping and nightlife and known for being 'weird'. Which they appear to be proud of on their literature. Its a good city to investigate. Planning on visiting Austin, easy trip into Austin. I don't know about traveling into Austin if you don't have your own ride. I guess taxis would come out, but seems like it would be expensive. Close to lots of eclectic restaurants. Fairly close to Austin for shopping if that's important. Lots of places to explore in Austin. A negative is the traffic around Austin and the need to always get on an expressway to get anywhere. Our lot could have been cleaned of leaves prior to arrival since it added to a messy site upon arrival. Are you affiliated with Oak Forest RV Park ?